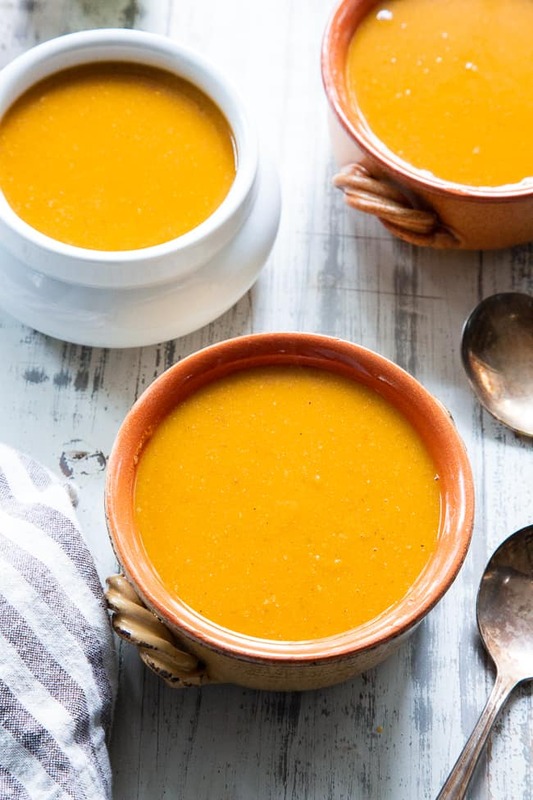 This Paleo and Whole30 butternut squash soup is creamy, sweet and savory! 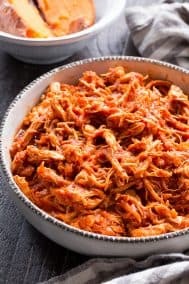 It’s made simple and fast in the Instant Pot for a quick healthy comforting meal. Bacon and apples lend sweet and smoky flavor to this fall and winter family favorite. It took me quite a long time to warm up to making homemade soup, believe it or not. After years of canned soups as a kid I just had a bad association with soups. Salty, flavorless, and all around boring – does this sound familiar to you?! I obviously realized at some point that homemade soups were another ball game entirely. Still, I really just didn’t have a strong desire to explore my options. 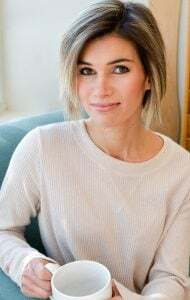 But, over the past year or so I’ve been working on breaking my bad soup association with some truly delicious clean eating homemade paleo versions. 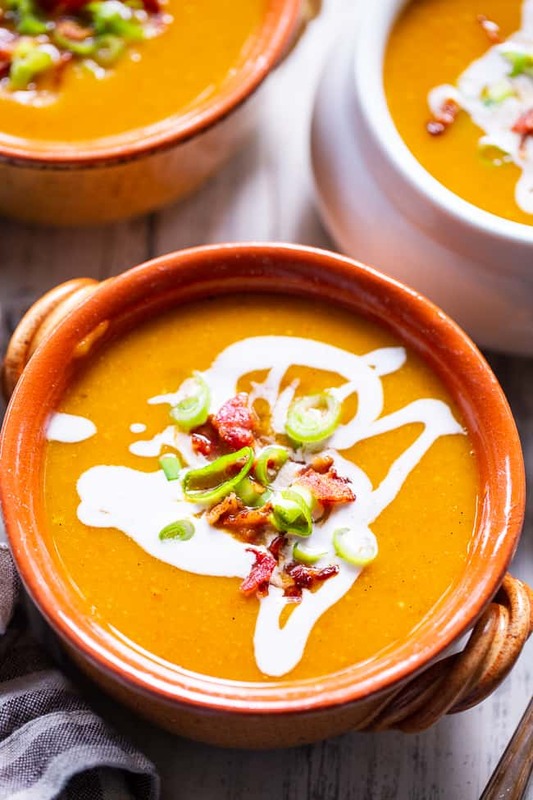 This butternut squash soup with apples and bacon is one of them! Packed with lots of my favorite ingredients, this soup is a far cry from the store bought canned variety. 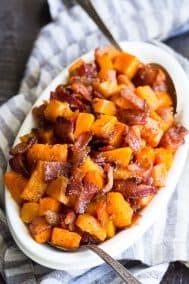 Butternut squash, apples, and bacon. 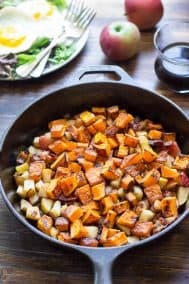 That combination remains one I just keep coming back to every fall, whether we’re talking a breakfast hash or a soup! And what makes it even better? 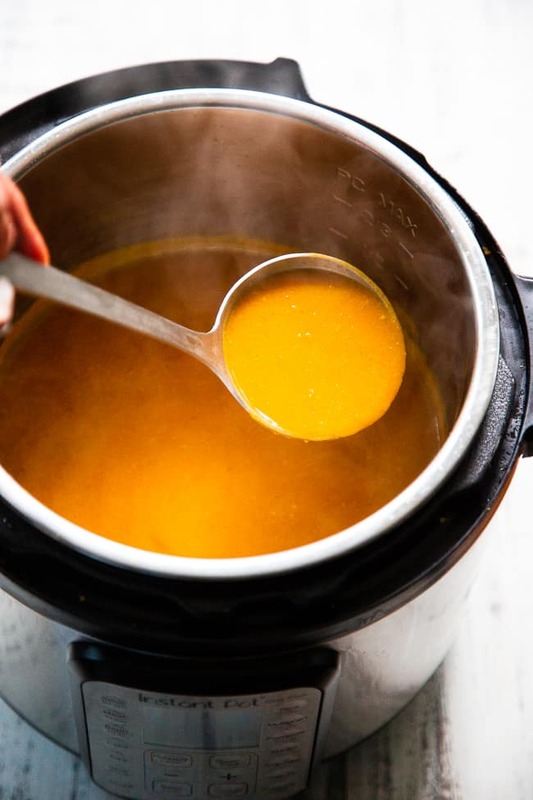 The fact that you make this soup easily all in one pot – the Instant Pot! I’ve been using my instant pot more and more lately and I’m always impressed by how efficient it is and how tasty the results are. One of the huge benefits of the Instant Pot, besides cooking things lightening fast, is the saute function. This means you can cook your bacon right in the pot first thing, and then use the bacon fat to saute the onions and garlic. Cooking everything in one pot makes this soup SO easy. To puree, I added my cooked bacon back to the pot and used my Immersion blender to get it all nice and creamy smooth. 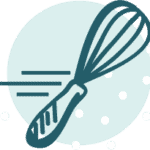 Instant Pot + Immersion blender is a dream come true combo for creamy soups! 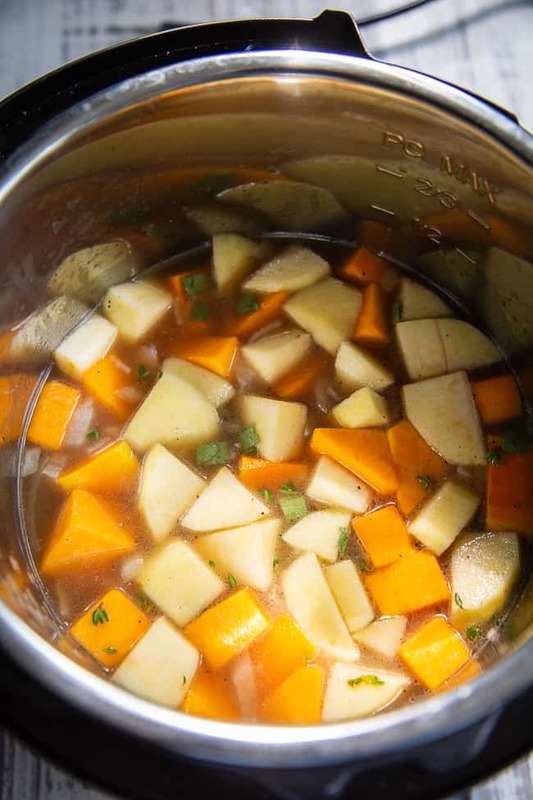 Once the soup is pureed you can simmer it a bit longer or taste and season a bit more to your liking. Then it’s time to serve and top the soup! I made sure I had extra cooked bacon to garnish (since most of the bacon actually gets pureed with the soup itself) and also sliced up some scallions for extra flavor. Lastly, if you’re a coconut milk fan, a bit swirled on top is a pretty addition and adds rich creamy texture. 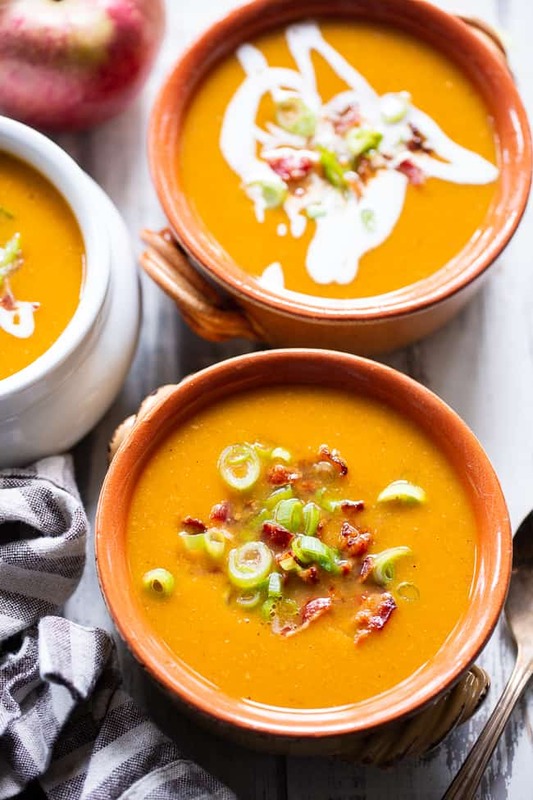 This butternut squash soup recipe makes about 6 generous servings. Additionally, the leftovers save well – woohoo! You can also make it ahead of time and refrigerate or freeze it to serve later on. 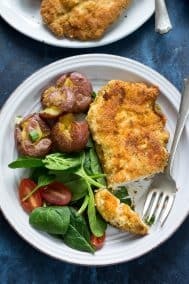 It’s sweet, savory, creamy, filling and of course healthy! 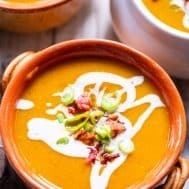 I hope you’re ready to forget canned soups forever and make this easy homemade comforting butternut squash soup – let’s go! 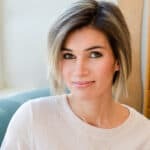 Turn Instant pot to “sauté” and wait until it reads “hot”. Cook bacon until crisp, stirring, remove to a plate and drain all but 1 tbsp fat. You will return bacon to pot when it’s time to blend. Add the squash, apples, herbs and spices, salt, pepper and broth. Cover pot and cook on high pressure 5 mins. Once cook time is up, quick release the pressure. Once soup is nice and smooth, you can taste and add any salt or seasonings to suit your taste. Serve hot garnished with a crumbled bacon and scallions. Swirl in a tbsp or two of coconut milk if desired. Enjoy! 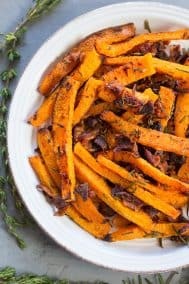 Want More Paleo Butternut Squash Recipes? Try One of These! 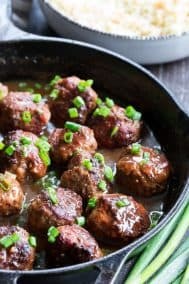 Can you make this in a slow cooker? If so how? I’d like to know as well. Thanks! 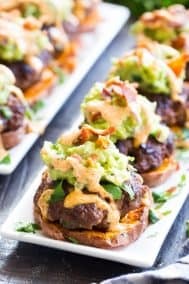 I just made this for lunch and it is DELICIOUS!! I just made it and it’s so good! Bacon, squash and apple is a winning combination. 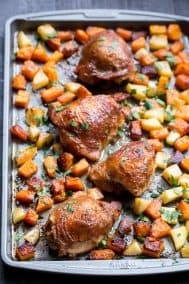 Love all your recipes, but this is truly an outstanding one and I just had to comment. Perfection! I’m so thrilled you enjoyed this one! Just want to clarify before I make it – do I use 10 total strips of bacon? Half of them get blended with the soup and the other half get used as garnish? Sounds great – but I don’t have an instant pot. C could this be made in a crock-pot? I made this tonight!! And it is AWESOME!! I subbed dry spices for the fresh (didn’t have time to run to the store)…and I had printed out the recipes…so I only saw 5 pieces of bacon…not 10. 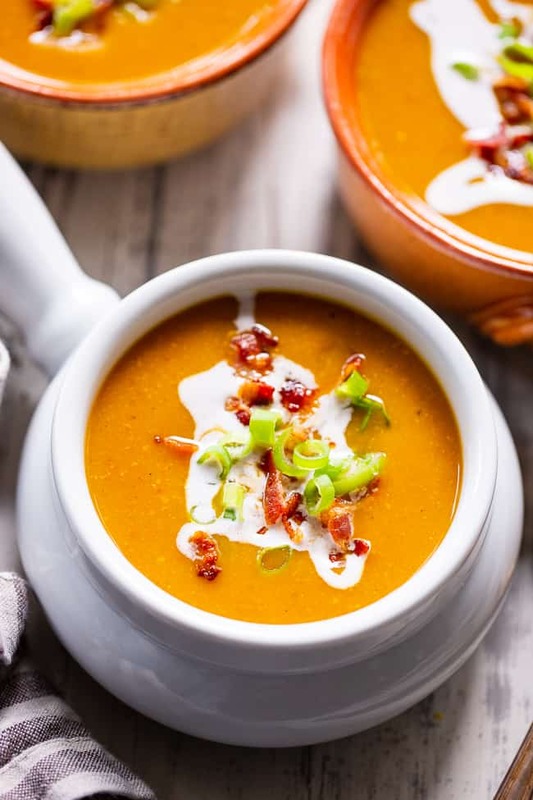 No garnish necessary…the soup is just awesome! !